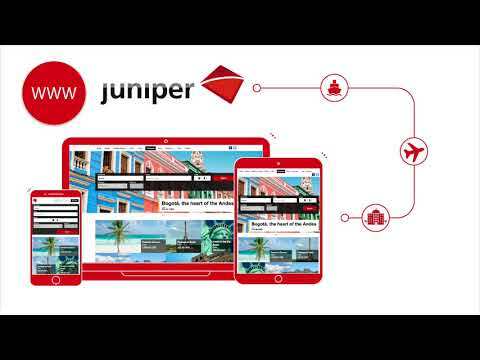 Juniper Booking Engine is a cloud-based platform for the travel and tourism industry, designed to help manage payment processing, itinerary creation, quoting, accommodation booking, rental car reservation, flight booking, promotions and packages, and more. The software offers different modules for businesses to select depending on their needs, and supports travel agencies, wholesalers, tour operators, destination management companies (DMCs), bed banks, and online travel agencies (OTAs). Juniper Booking Engine can be connected with external suppliers through XML interfaces, allowing users to offer a wide range of products and services, and with multiple distribution channels including online B2B and B2C channels, call centers, and point of sale (POS) terminals. Different packages and prices can be offered through each channel, with support for both net and commissionable prices, and all product inventory and bookings can be managed from the centralized database. Juniper Booking Engine allows clients to make bookings online 24/7, with automated booking confirmations, payment processing through integrated gateways, and automatic delivery of trip vouchers. Multiple currencies and languages are supported, and website content can be translated and booking prices converted dynamically. Juniper Booking Engine also lets users set different access permissions to control employee access to back office functionalities and the purchasing conditions offered to different clients. Nothing can beat juniper in sales distribution and handling. All customers come under it's scrutiny and makes easy for checking prices, stocks and much more. When we have insight into customer, we can easily sell. All of the modules are not relevant, every company should be easily able to customize according to their needs. Contact Juniper for pricing information. • Juniper Booking Engine integrates with a range of distribution channels, and allows users to manage all bookings received, which are stored in a single database regardless of which channel generated the sale. • Customers can be kept updated on any new special offers, and Juniper Booking Engine enables the ordering of products and services 'on request' if there is no current availability. • Users can manage their product inventory through the web-based interface, and set up different conditions to offer clients, with both net and commissionable prices. • Integrated payment gateways allow users to accept payments in multiple currencies, with the option to automatically convert booking prices into different currencies. • Bookings can be accepted 24/7, confirmed automatically by Juniper Booking Engine, and trip vouchers can be delivered to clients or travelers. Below are some frequently asked questions for Juniper Booking Engine. Q. What type of pricing plans does Juniper Booking Engine offer? Q. Who are the typical users of Juniper Booking Engine? Q. What languages does Juniper Booking Engine support? Q. Does Juniper Booking Engine support mobile devices? Q. Does Juniper Booking Engine offer an API? No, Juniper Booking Engine does not have an API available. Q. What other apps does Juniper Booking Engine integrate with? Q. What level of support does Juniper Booking Engine offer?